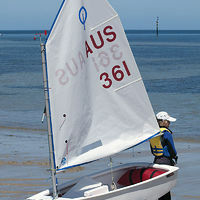 The Optimist is a small, single-handed sailing dinghy intended for use by children up to the age of 15. Nowadays boats are usually made of Fiberglass, although wooden boats are still built. It is one of the most popular sailing dinghies in the world, with over 150,000 boats officially registered with the class and many more built but never registered. The Optimist is recognized as an International Class by the International Sailing Federation.